It has been said, “There’s what happens, and then there’s what we make it mean." There can be a significant difference between the two, and that difference is known as experience bias and can be a decision trap. In an extreme example of experience bias, there is the story of the salesman who sold door to door, ringing countless doorbells. Once he came to a home that just happened to have a gas leak, and when he rang the doorbell, the spark caused an explosion. While this was a definite outlier case –one in a million- the sales rep never got over the association between ringing the doorbell and the gas explosion. He just could not ring a doorbell again. At its essence, experience bias is where we look at what has happened and don’t just take it at face value, but make it mean much more than it actually does. We eliminate good decision choices because we wrongly interpret them as undesirable. We choose from a set of decision possibilities simply because they do not have the undesirable (incorrectly!) element. We are not able to speak logically, honestly and holistically with our team members and stakeholders because of our inherent experience bias – undercutting our ability to lead. Our organization may suffer a loss in its effort to reach its strategic objectives, as supported in the project, simply because you could not separate out experience bias. Team members and stakeholders are smart – and some will soon recognize the cloudiness of our thought process…further eroding confidence and hurting morale. Being aware of experience bias is critical to our success. We need to extract out each experience only the wisdom that is within it – and not falsely extend our conclusions by associations far beyond what makes sense. Can you think of an area where you have made something mean more than it should…and thus where you need to better manage your own experience bias? 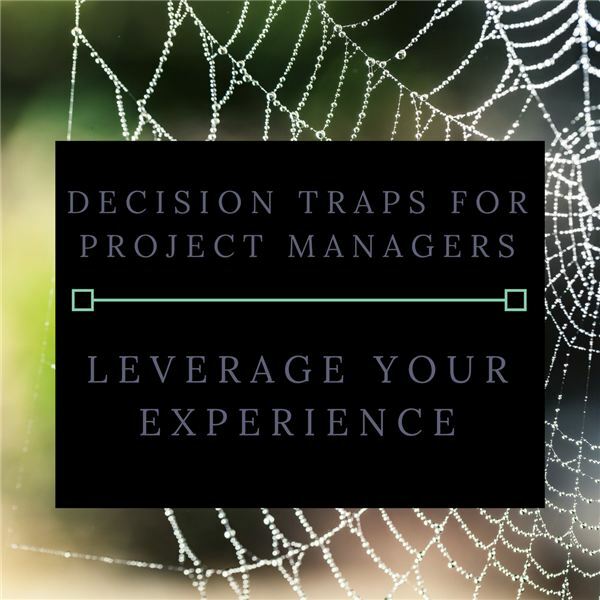 Decision traps can cloud a PMs thinking, causing huge amounts of time, money and pain. In this series, we are exploring four that are particularly relevant to project managers.